No one can prepare you for the actual act. It’s no act though, it’s real and believe me it’s tough. No one can describe how the uncertainty of not knowing where you are going can fry your insides. There are lots of suggestions on how to kick start a new life. But when you come to doing it it’s a bit like jumping off a cliff or to use a more modern euphanism, launching yourself into space. I had plenty of time. We’d done it before- twenty five years ago. Memories weren’t of babies and toddlers, more of the teenage years, weddings and grandchildren. A full on time. Running a livestock transport business and starting my writing career. There, that was all. Lots of paper trail for those two. But there was more. There is a lot of history you uncover. So many things you’ve forgotten. My parents story, Ric’s parents, our grandparents. Last night I watched the film about the Whaler with my heart in my mouth. My grandfather was there in Egypt, in the Light horse. Did you know they wore emu plumes on their hats? That broke me up, I can tell you. So you run through times that were important to you, you pick up a book or a picture and just think about it, hold the memory close. ‘What will I do with this?’ turned into ‘Quick another box and I’ll decide later’. The result – an awful lot of boxes. An author who can relate to a lot of this is Jenn McLeod, whose new book, ‘Season of Shadow & Light’ was released in April. Jenn has experienced the angst of moving out recently. She has answered my few questions on gardening and writing. Thank you Jenn. 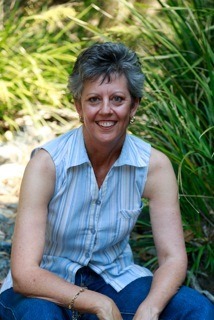 Hi Jane, nice to be here talking gardens. I am kind of missing mine. A while ago I sold up and hit the road in a caravan. Now I’m looking forward to discovering the magnificent flora across this very beautiful land of ours and working things like boabs (fantastic trees) and wildflowers into my stories. 1 What do you like starting with – a seed, a seedling or an advanced mature tree? Definitely a seed. My stories start out as seeds—ideas that start small and grow, often surprising me. To watch something take shape—a plant or a story—is very rewarding. 2. When you create a path is it a mystery tour, or a definite plan to get from A to B? I once tried to create a magical, mystical garden with little treasures hidden among the plants and trees. I failed! Weeds took over and the place looked very unloved. It is very difficult to keep a garden AND write! When I plot a story, however, I love not knowing where I’m headed, so no planned path for me. 3. When it’s time to prune do you get out the secateurs or the chain saw? Ha! Another book analogy, I’m afraid. As with edits, some greenery requires delicate snips here and there, while others require the chain saw approach. Jenn sent me this picture. 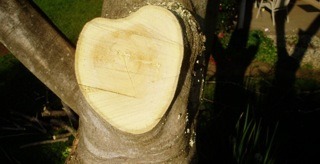 Only you Jenn could attack with a chain saw and end up with a love heart…………..
4. How easy is it for you to let people loose in your garden to weed and plant – even to dig holes where you tell them? Go crazy, I say! No permission required. If you want me, I’ll be at my desk! 6 Would you rather put a plant in a pot, or in the garden, or out in the paddock? Depends on the plant. I Love letting pumpkin run rampant and tiptoeing through the vine to discover new pumpkins. Never had much luck growing anything in a pot. Too constrained. We all benefit from space and that’s why I love the country. 7. What stage would you say your newest work is at – in gardening terms? Oh, well, Book three (Season of Shadow and Light) is out April 1, so it has been at the delicate secateurs stage of edits. Book four is a seedling. The idea has sprouted and the plot is starting to take shape. 8. Do you have a favourite, flower, leaf or tree? Too many to mention. I love autumn leaves (as long as I don’t have to rake them) but I have a soft spot for dandelion. Some call it a weed! It’s not. To me it’s childhood. I even called my old house in House for all Seasons The Dandelion House in honour of the fragile gossamer ball I used to make wishes on as a child. Thank you so much Jenn, for joining us today. Thank you, Jane. Always lovely to catch up with you and hubby at conference. Great blog – I’ve never met a calmer “move house after 25 years, attend the sheep show, win grand champion, attend sons wedding and all In one shortnweek” person in my life. You’re a champion.